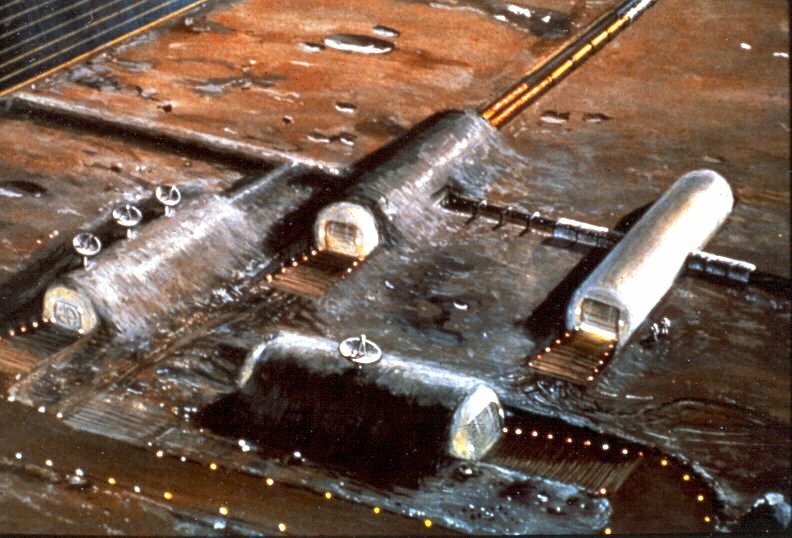 Low Earth Orbit Spaceport – The existing Alpha space station is fine for research, but we are in need of a space station optimized as a transportation node. An equatorial orbit may be best for supporting traffic to higher orbits, the Moon, and beyond. 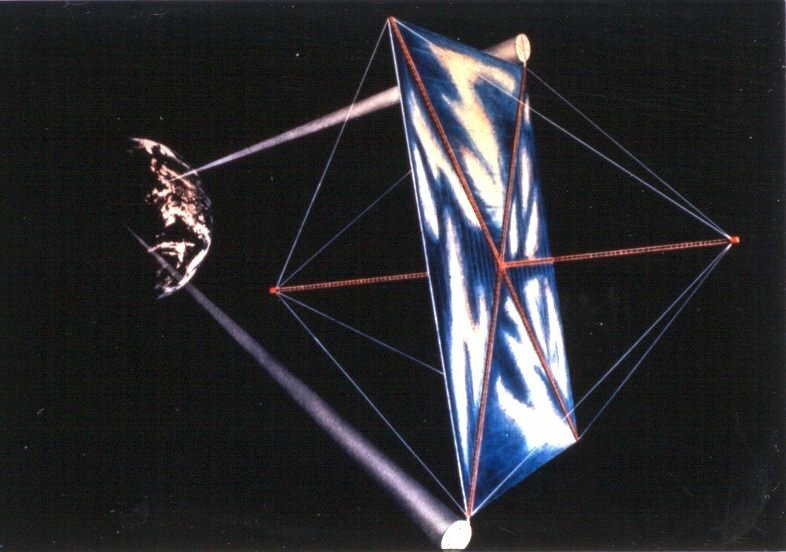 Solar Power Satellite – A Solar Power Satellite in Geosynchronous Earth Orbit is in sunlight 99 percent of the time. 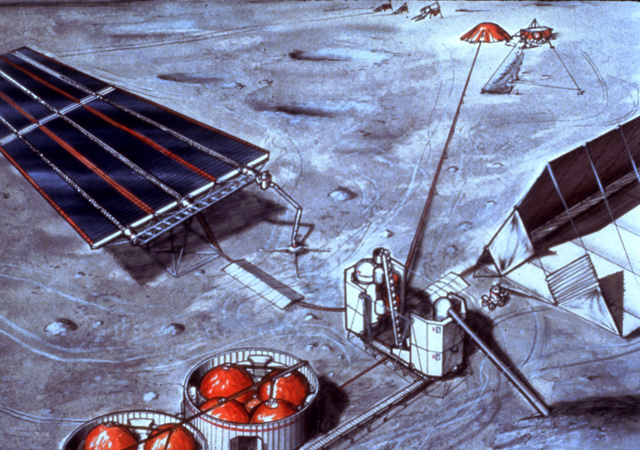 Unlike ground-based solar arrays, it can generate electricity continuously. 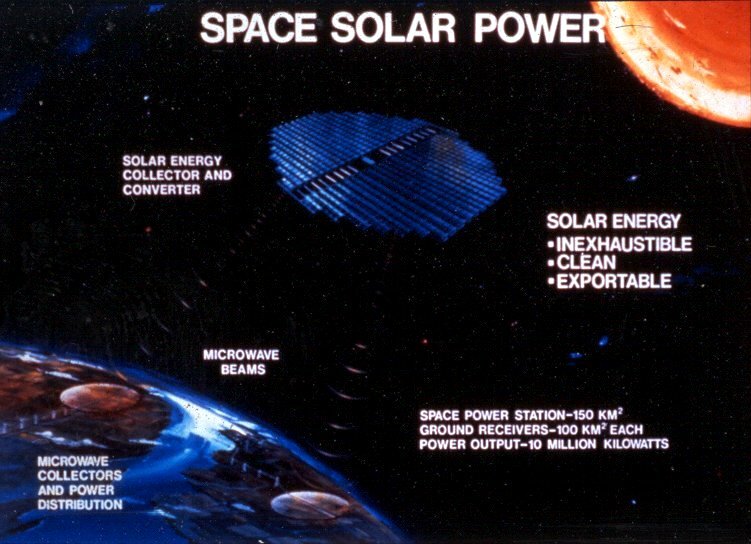 Power From Space – A Solar Power Satellite generates clean, inexhaustible power for Earth. 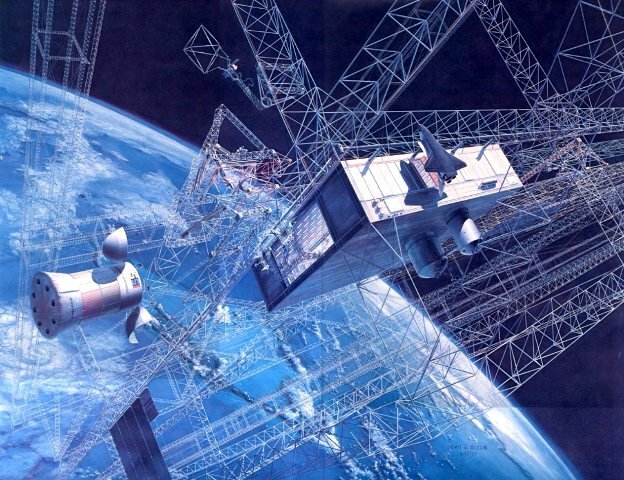 Solar Power Satellite Construction Base – Building Solar Power Satellites in Earth orbit will require massive orbital infrastructure. 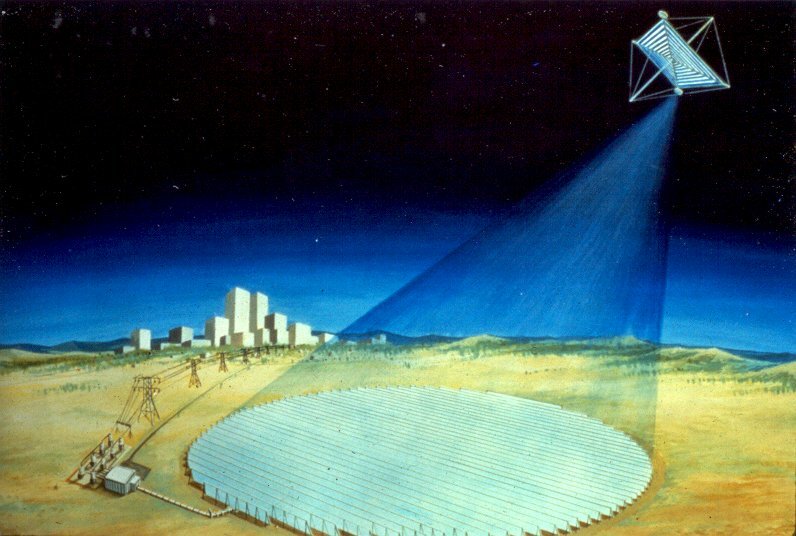 Power Beaming – A SPS beams power to Earth via two safe, low-power microwave beams. Rectenna – SPS power is beamed to a receiving antenna or “rectenna” on Earth. The rectenna converts the energy back into electrical current, which is fed into the power grid. The power beam would be safe for insects and birds flying through, and would not reach plant life growing under the rectenna. 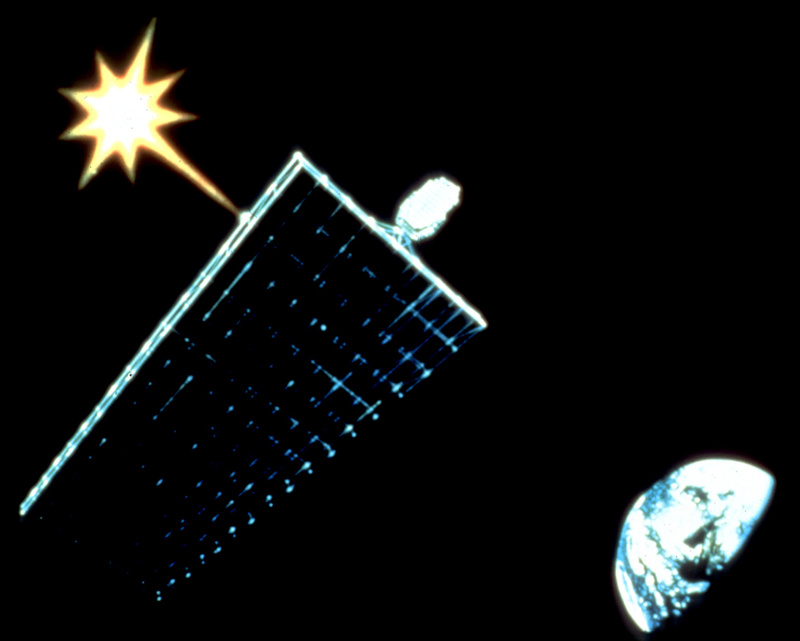 Clean, Safe Power From Orbit – A Solar Power Satellite safely feeds the energy needs of a complex world. A small plane is shown flying near a transmission area. 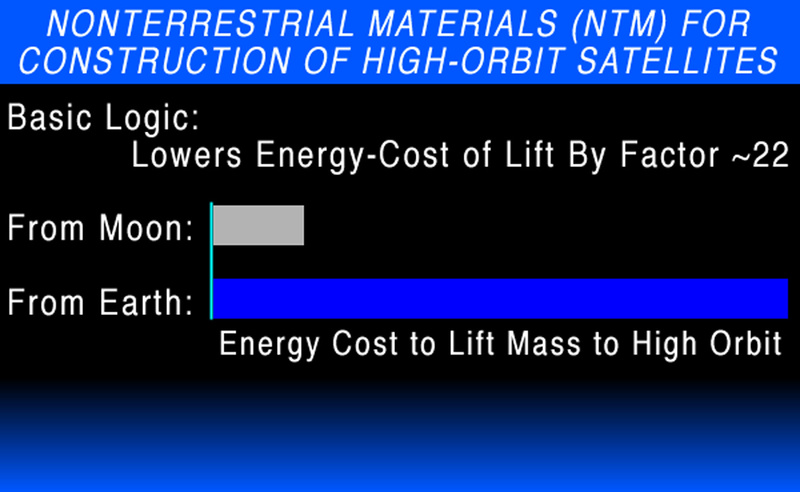 Using Material From Earth is Expensive – Due to the Earth’s much greater gravity, lifting items into orbit from the Earth is much costlier than obtaining building materials from the Moon (or asteroids). 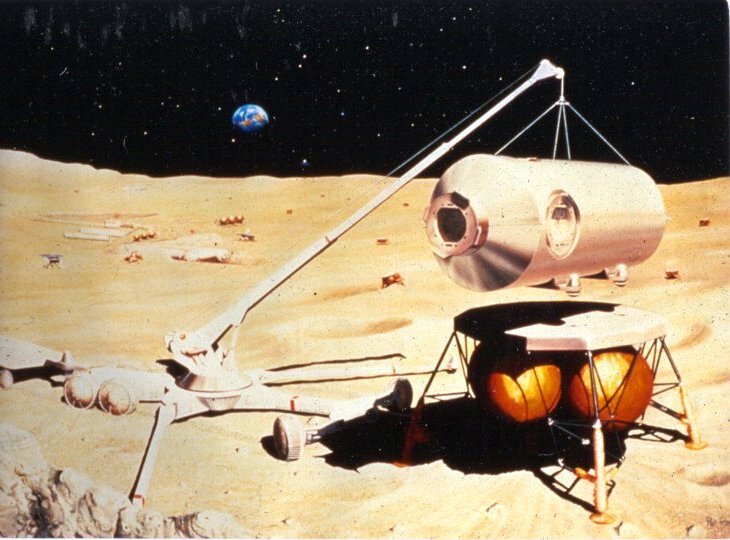 Reusable Lunar Lander – A crane offloads a habitation module from a lander. This lunar effort must proceed in a more sustainable way, for this time we are on the moon not for political purposes, but to do economically valuable work. Using Soil for Protection – Lunar soil or “regolith” will be piled up over the modules. 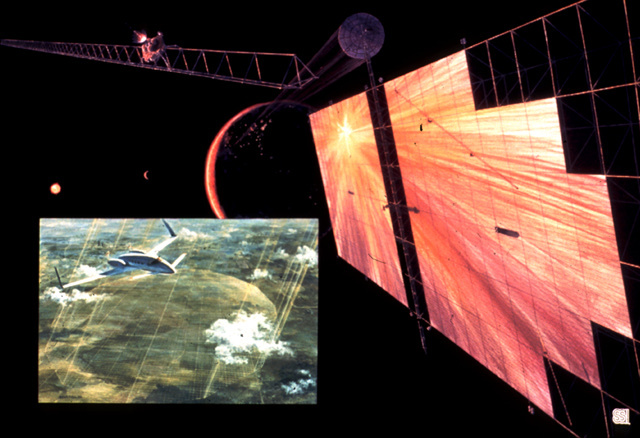 This will protect the inhabitants from both cosmic rays and micrometeoroids, as well as reduce temperature swings. As it happens, dust in a vacuum is excellent insulation. 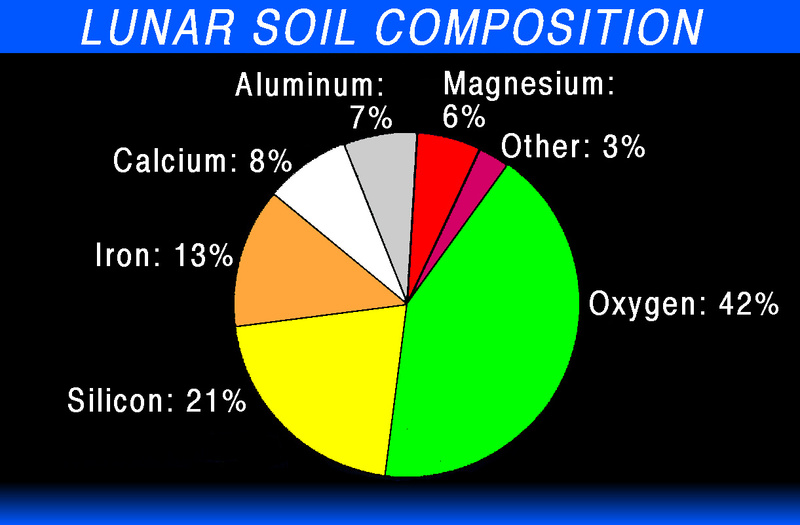 Lunar Paydirt – The rich Lunar Soil is composed of many minerals that are the raw materials required for life support, rocket fuel, construction and development. Methods of extracting these raw materials have already been developed using existing technology. 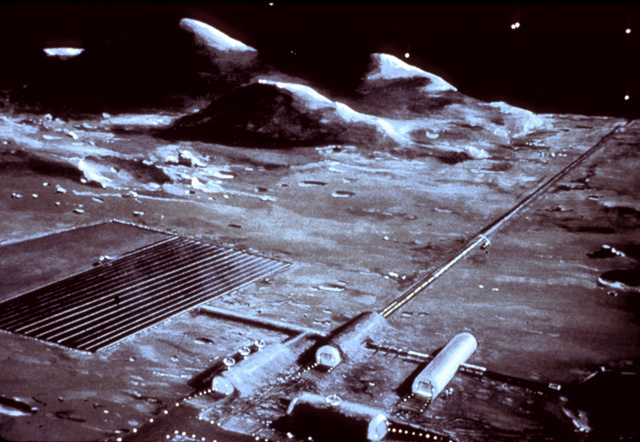 Lunar Mining – A mining base powered by solar collectors provides the materials for further construction on the Moon and in Earth orbit. 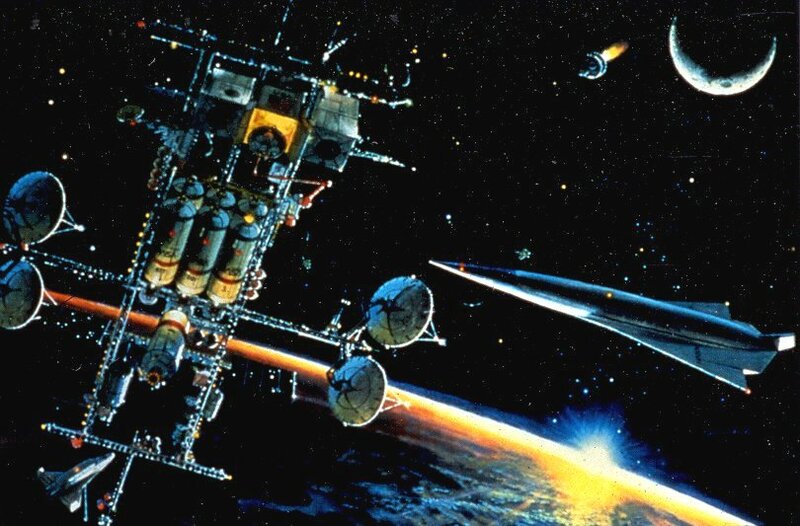 The Mass Driver – Space Studies Institute has built progressively more powerful models of the mass driver, a kind of electromagnetic accelerator. 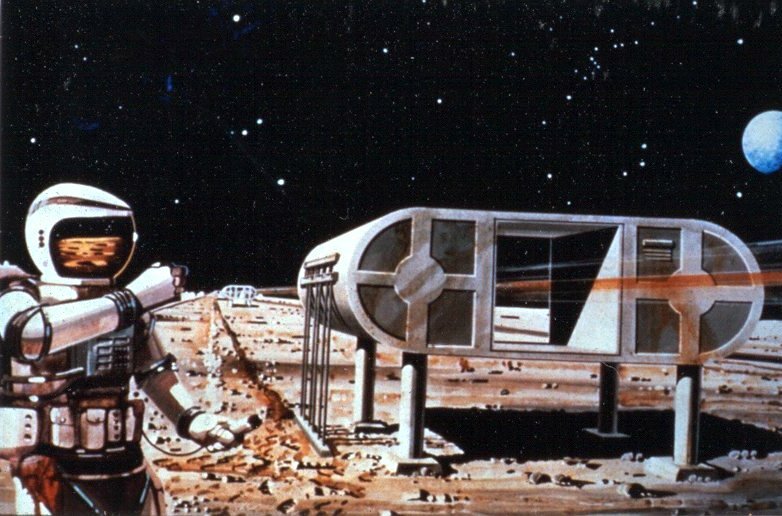 Such an electrical catapult could economically launch lunar material into space. 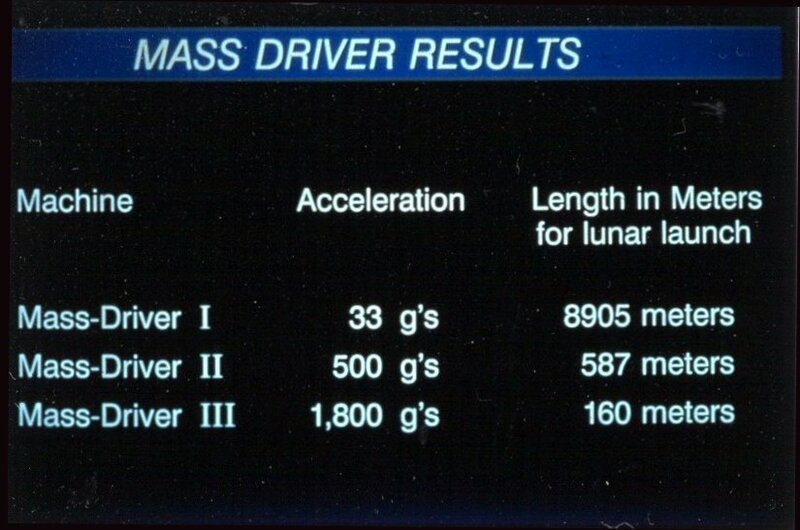 Mass drivers with the same accelerating power as has been demonstrated in the lab can do this within reasonable lengths. Mass Drivers Deliver – Electromagnetic mass drivers using solar power provide low cost transportation of materials to space construction sites. Astronaut at Far End of Mass Driver – Deflection plates near the end of the mass driver make minute adjustments to the trajectory of the launched ore to ensure it reaches its target: a mass catcher at the L-2 point. 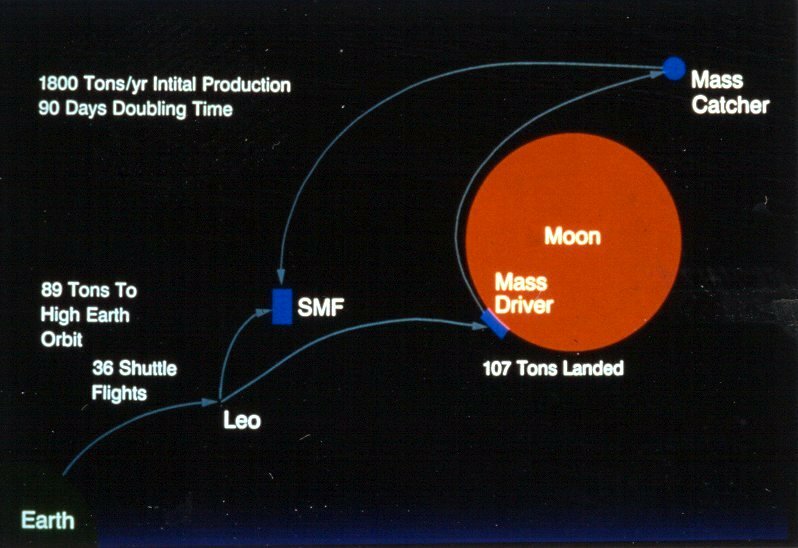 Flow of Lunar Materials – After a load of lunar ore is accumulated at L-2, it is transported to a Space Manufacturing Facility (SMF) in High Earth Orbit. 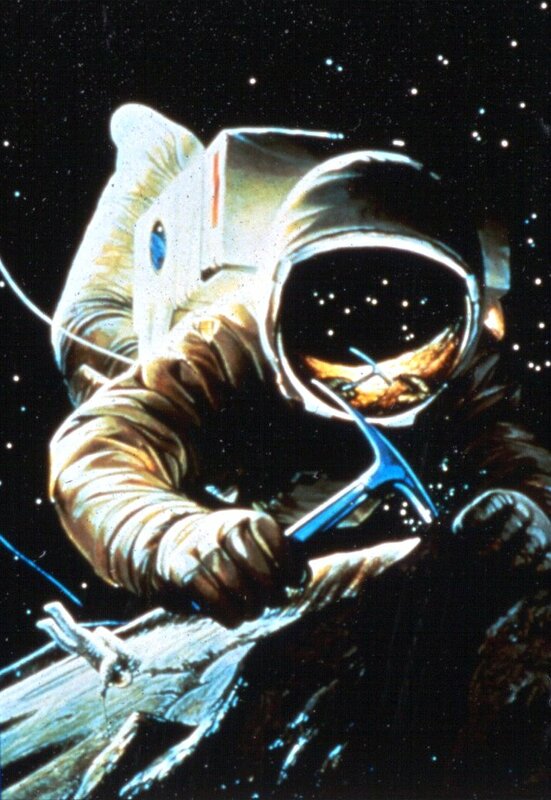 NEA Probe – Raw materials from many Near Earth Asteroids can be accessed with energies comparable to those required for lunar materials. 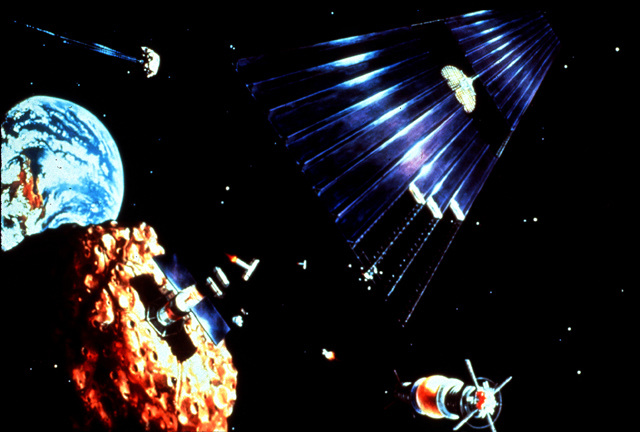 But before we can range further afield for space resources, we must first launch probes. Sample return missions would be especially helpful, as well as scientifically invaluable. 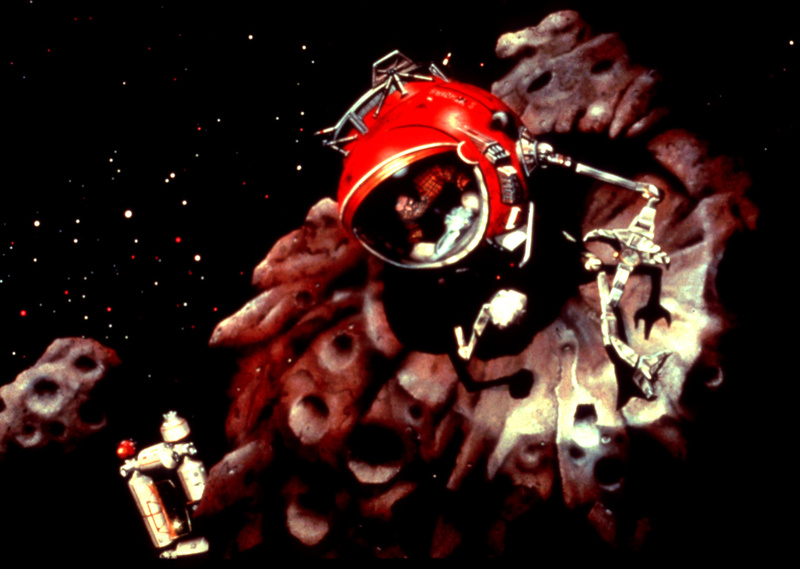 Assaying a NEA – Where our machines go, humans will eventually follow. On-site investigations will answer questions about surface conditions, and subsurface compositions. 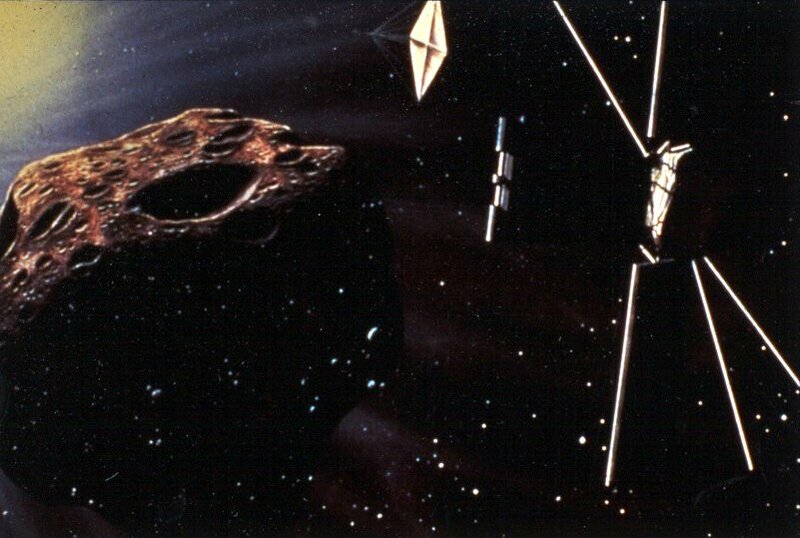 Space Resources – An asteroid with a small processing station provides material resources for construction of a Solar Power Satellite as well as the first permanent orbital settlement.